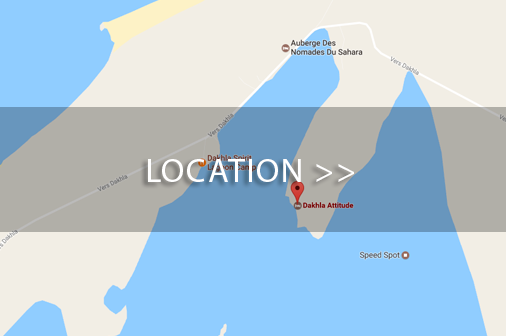 The RIHFLY DAKHLA nautical center is located in Dakhla Attitude hotel in the wider area of ​​the lagoon called Dragon Point. The spot does not have any dangerous areas, which makes it very easy to learn kitesurfing and windsurfing and improve your level really quickly. RIHFLY DAKHLA is the biggest nautical center in Dakhla and has large and well maintained facilities. It is open all year round and offers courses in kitesurfing and windsurfing as well as equipment rental throughout the season. CABRINHA equipment is used for kitesurfing and GAASTRA (sails) TABU (boards) for windsurfing. The Sailing Center has a motivated team who speak different languages. Their main desire is to share their passion for kite surfing and windsurfing. Nautical center hours are from 9h00 to 18h00 in winter season (November to March) and the rest of the year from 9h00 to 20h00. In addition RIHFLY DAKHLA has 2 rescue boats running continuously from opening to closing to assist clients in need of help, as well as assistance on the beach to launch and land the kite. At Rihfly Dakhla Sports Center all instructors are IKO or VDWS certified and lessons are taught with the latest Cabrinha equipment mainly in English or French but also in German, Spanish and Arabic. Semi-Private Lessons are ideal for those wanting to make progress faster. One monitor, 2 students. Kitesurfing equipment included : wetsuit, harness, helmet, life vest and complete kite set. 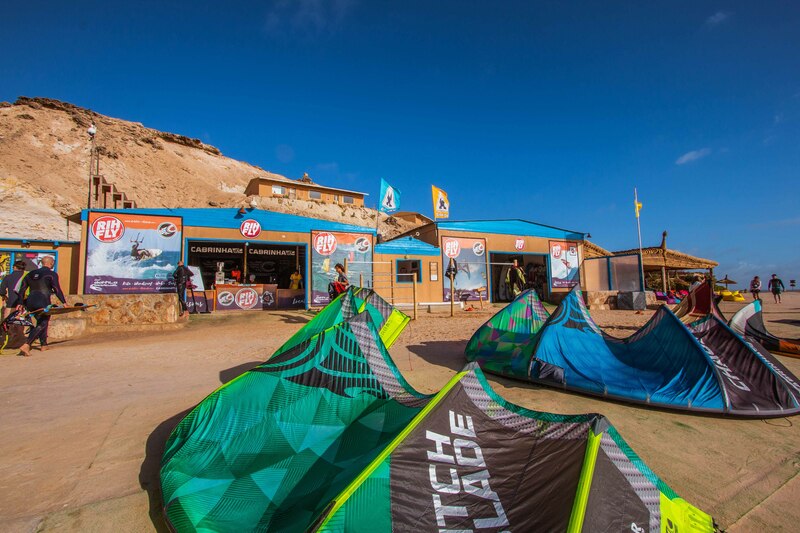 Rihfly Dakhla Sports Center guarantees you high quality kiteboarding equipment from Cabrinha. Over 100 Kites and 75 boards are available in many different sizes and you can change kites and boards at any time and as many times as you like.That way you can try out brand new material aswell as always pick the right sized kite for each wind condition. Additionally all renters can use the kayaks for free. In the case of no wind (which is very rare!) all pre-booked rentals can be exchanged for any of the sport related excursions like surf trips, wake sessions etc. If you don’t want participate in any of them you are provided with a voucher for the remaining rental. This awesome new activity for 2014 ensures you will be riding every day and every hour if you like to, even if the wind stays out! The brand new cable park has great objects to jump or slide and different velocities to choose from. The 140mx45m big pool even offers two small kickers for beginners and kids. On wednesdays and saturdays night sessions with great illumination are available. This is the perfect no-wind substitute. One session is 8 minutes long. Price 9€ per person 6/7 days. The storage warehouse in under surveillance; however, the center is not responsible for any loss, damage, or theft. 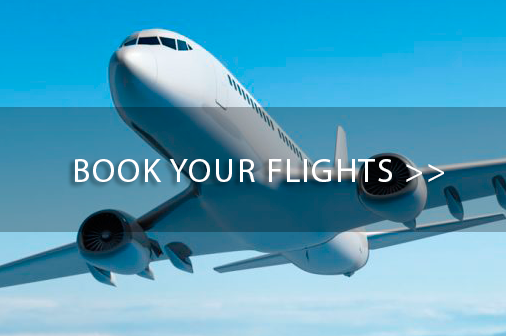 -To confirm prebooked rates it’s mandatory the payment of 100% in advance. 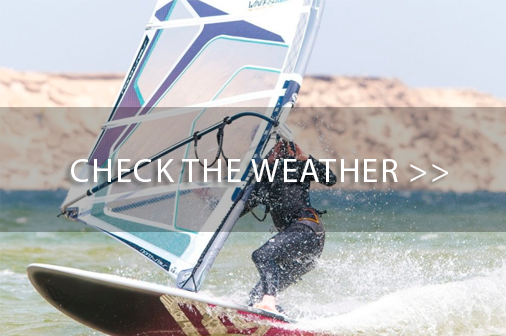 -Boards/kite rental only -30% on standard full equipment rental price. – Unused sports services will not be reimbursed. If you cannot make use of any prepaid sports services during your trip, due to lack of wind or no wind, you will be offered alternative activities such as surf lessons or rental, SUP etc… If you don’t want use any of them we provide you with a voucher for the remaining lessons valid for 3 next years. Voucher is only valid for lesson, no rental. -In order to be able to rent equipment, you must have attained a minimum of an intermediate level rider, or IKO level 3. You must be able to ride upwind.